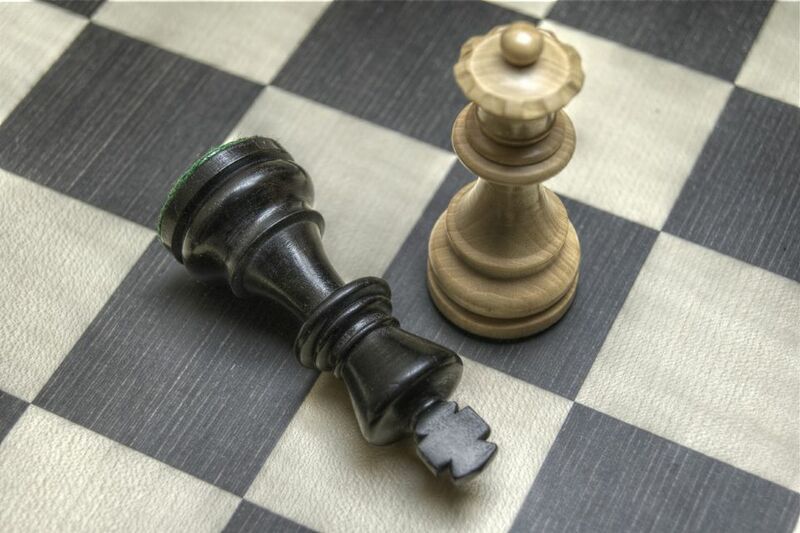 A player’s king is said to be “in check” when it is attacked by an opponent’s piece. In the diagram above, white’s king is in check because the black rook on a1 is attacking it. Usually, novice players are expected to announce check when it happens in order to be sure their opponent notices the situation. Among more experienced players, many consider it rude to announce a check, as these players expect to notice the check themselves. It is never legal to move your king into check; if you notice an opponent has done so, you should point this out and allow them to make a safe move instead. If your king is in check, you must find a way to prevent the king from being captured. There are three ways to accomplish this. The first method is moving the king to safety. If the king can be moved to a square where it is not attacked, it no longer needs to fear being captured. In the diagram above, the white king can safely move to d2, e2, or f2, as the black rook only attacks the squares on the first rank. The second method is blocking the check. This is also known as interposition. In the above diagram, white’s queen can be moved to c1, where it would block the check from black’s rook. Blocking is not an option when the attacking piece is a knight, as the knight can leap over any interposing piece. The final method is capturing the attacking piece. In the diagram above, white’s queen can capture the black rook on a1. With the rook off the board, the white king is once again safe. If a king is under attack, but none of these methods can be used to prevent the king’s capture, the result is a checkmate. In the above diagram, the white king is under attack from the black rook on a1. There are no safe squares for the king to move to, and white has no pieces with which to block the check or capture the attacker. White’s king is checkmated, and black wins the game. It is important to note that checkmate ends the game immediately. It is neither necessary nor correct to capture the checkmated king. A stalemate occurs when one player has no legal moves and is not in check. This ends the game immediately as a draw. In the diagram above, it is white’s turn to move. While white’s king appears to be in danger, he is not attacked. However, black’s pieces are attacking every square white’s king could possibly move to. As white is not allowed to move his king into check and has no other pieces to move, he has no legal moves, and the white king is stalemated. The game has ended in a draw. Note that if it were black’s move, black could win the game by moving his queen to either d2 or a1. Either move would result in a checkmate. Stalemates are common for beginners who have yet to learn basic checkmating patterns. It is important to be careful in the endgame; even the most lopsided game can become a draw because of an unfortunate stalemate.